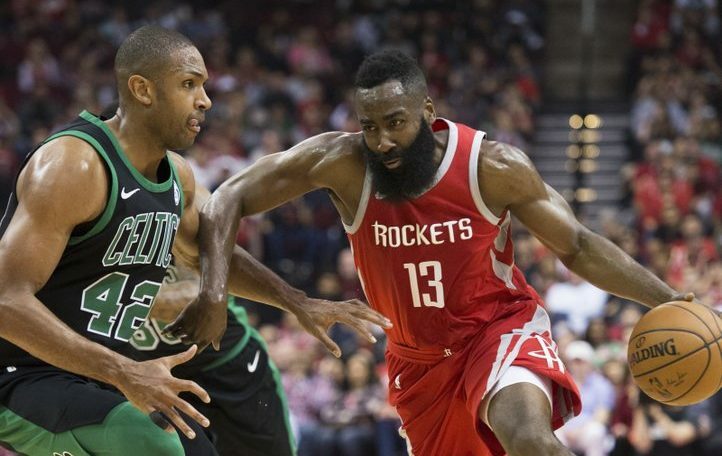 The game between the Houston Rockets and the Boston Celtics played out just like a game between two championship contenders. It was a tight, back and forth affair that ended up being decided in the final minutes of the game. The Boston Celtics travelled to Clutch City, Texas and were looking to upset the best team in the league. In the final period of the game, they jumped out a six-point lead twice. Then Celtics looked like they were going to out-clutch the Rockets. The Rockets usually rely on their stars, James Harden and Chris Paul to bail them out of situations like this. But this time around, it was the role players that stepped up. Trevor Ariza got the run started with a drive and dish to a waiting Eric Gordon for a three-pointer to cut the lead down. PJ Tucker added a three-pointer from the wing to continue to cut the Celtics lead down. Ariza added a three-pointer from the right wing to tie the game at 115. He then played the passing lanes well to get a steal and a fast break layup to give the Rockets the lead. Houston nailed their freebies to stay a safe distance away from the Celtics. Eric Gordon played big in the final period as he scored 13 of his 29 points in the quarter to lead the Rockets. Harden had a double-double of 26 points and 10 assists. Ariza shot only 4/13 from beyond the arc but got his shots to fall at the right time. He finished with 21 points. If the Rockets lost this game, they would have tied with the Golden State Warriors. But because of their clutch performance, they stay half a game above the Warriors for the best record in the league. Ever since he returned from an MCL injury, Lonzo Ball has been on fire from beyond the arc. He’s shooting 63% from three-point land (14/22 in four games). It’s a very small sample size but it’s an encouraging sign considering before this four-game stretch, Ball was shooting 30%. What’s even better is how comfortable he’s looked stepping into the shots that he should be taking. Before the injury, Ball was hesitant to take shots, even with defenders miles away from him. Now he looks ready to take shots that the defense gives him. This was evident in the final minutes against the San Antonio Spurs. Ball hit two big three-pointers to deliver the win for the Lakers. The first was off a bail-out pass by Julius Randle. Ball fired up the shot with the clock winding down to get the Lakers to within one point. The second shot was off a screen. Ball’s defender got hung up on the pick and he rose up for a trey on the left wing to give the Lakers the lead. He sealed the win with a nice pass to a rolling Randle for the layup. Ball had another awesome game and finished with a near triple-double. He had 18 points, seven rebounds and 11 assists. He’s the first Laker to have 11 assists and six treys in a game. The Lakers extend their win streak to five games. The Portland Trail Blazers have won six straight games. In the competitive middle tier of the Western Conference, that’s enough to get them up to the third seed. CJ McCollum led the Blazers with 28 points, eight rebounds and six assists. The Thunder fall to seventh in the West with this latest loss. Only two games separate the eighth seed and the third seed. A loss here or a win there is enough to move teams up and down the standings. This was a big win by the Blazers who are usually a Playoff contender but in the 5-7 range. If they manage to stay in the third seed, this could be their highest finish in the past few years. Did an NBA superstar get ejected today? No. But SLAM PH EIC Nikko Ramos was out in San Antonio for the Lakers-Spurs game. Check out the sights and sounds from his road trip.